Thanksgiving treasures – that will melt your heart. Take a peek at our Thanksgiving treasures. Stunning 3D Turkey Cookies and adorable Thanksgiving inspired chocolates are great ideas for a Thanksgiving dessert table. Just looking at these photos make my heart melt – so cute! Thanksgiving is just a couple weeks away – make sure your pantry is stocked with everything you need for your holiday baking. Sprinkles, quins, sanding sugar, wafer paper, cupcake picks and much more – available at fancyflours.com. Check out our entire collection of Thanksgiving baking and decorating goodies by clicking HERE. 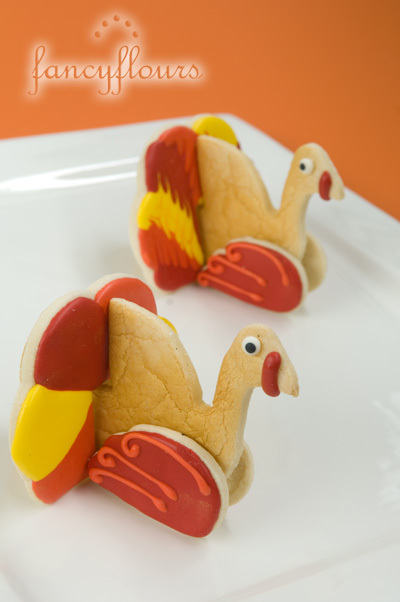 3D Turkey Cookies are made with our 3D Turkey Cookie Cutter, Royal Icing Mix, and Sugar Eyes. Choose 3-4 warm hues for your food colors. We love gel food coloring – perfect for intense icing colors. Thanksgiving chocolates are a cinch to make. 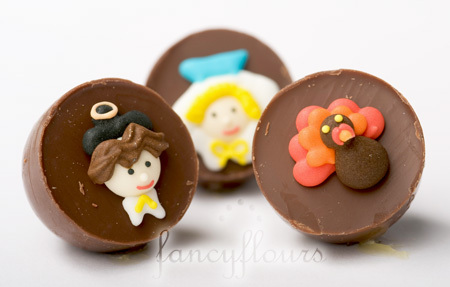 Buy a box of your favorite truffles – then use a thick consistency ofroyal icing to attach our assortment of Thanksgiving sugar whimsies. Let dry and serve. Yum! Thanks so much for being our Fancy Friend! Best Thanksgiving baking wishes to you all. Barley Candy Turkey & Leaves on Sale! Just in time for Thanksgiving! Our collection of select Barley Candy Decorations is on SALE – 50% Off! Add a touch of fall color to your Thanksgiving baking projects with a darling candy turkey or stunning maple leaf on top of your pies and tarts. Barley Candies are a festive option for classroom parties and a clever idea for cupcake toppers too! See our entire selection of Barley Candy Decorations by clicking HERE. Enjoy the spirit of the season – and get baking! Wow all those little trick-or-treaters this year with these darling and oh! so tasty festive and fast treats for Halloween. These chocolate sticks and cookies can be made in less than 10 minutes! And the caramel apple cut-outs are boo-tiful-y simple. The kids will love to help out too. We used our Royal Icing Comical Halloween Assortment and Royal Icing Mini Halloween Face Assortment to create the chocolate treats. The caramel apple cut-outs were made using the Mini Halloween Cookie Cutter Set. Check out our how-to page for step by step instructions and recipes for over 30 fall and Halloween how-to guides! Great baking projects don’t have to take all day – simplify your baking with some of these great Halloween ideas. Happy Halloween Baking Fancy Friends!